Hey everyone, so I have been holding back on posting this combination…was going to wait till the Holidays but I just can`t help myself so here we go! Now I willingly confess I was never the most glitter obsessed polish lover but this combination has sent me in a tail spin!! Now everything I crave is GLITTER lol. Milani `Purple Gleam` + Sally Hansen Extreme Wear `Rockstar Pink` – is probably the most gorgeous glitter combination I have ever seen! The best part is that these are DRUGSTORE nail polishes!! 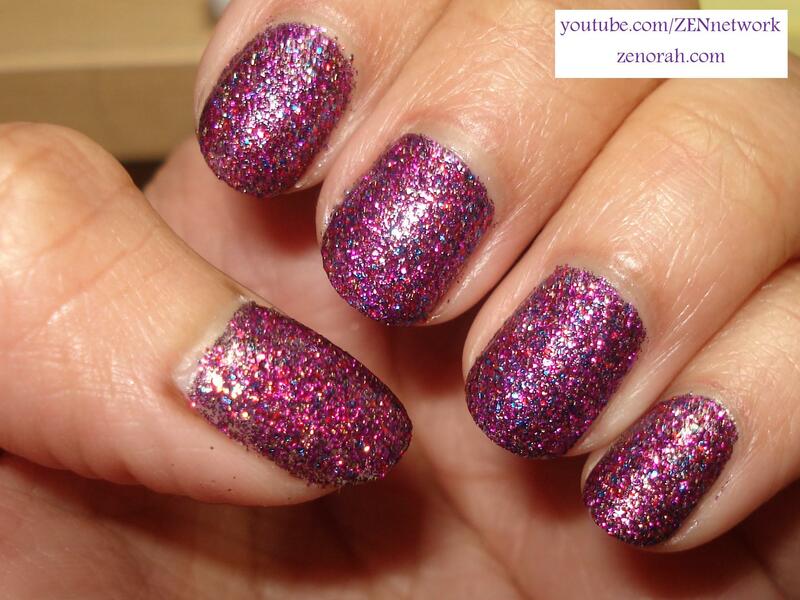 The Milani `Purple Gleam` is a one coat glitter as it states on the bottle but I did two coats to achieve an opaque finish and then layered it with one coat of SHEW `Rockstar pink`. I am not sure if the Milani glitter one coat is limited edition but I do know for a fact that Rockstar Pink is a permanent shade, I just never found the right polish to wear it with UNTIL NOW!! This is such a glittery holiday inspired manicure but I am going to wear this baby regardless of seasons! The dry time was amazing, it took literally I kid you not, only a few minutes on each hand to dry WITH a top coat – I am so impressed at this point, I think I want to try more of the Milani One coat glitter (I have one remaining to swatch courtesy of my friend Holly when we did a swap earlier this year, so I am super excited to see how that one turns out!). While the polish is more on the `purple` side, I LOVE the blue, pink, silver multi-glitter particles just glistening off the nails. I am so super pumped about this manicure I am going to try layering all of my glitter polishes from now on and I encourage you all to do the same, I would LOVE to see what combinations you guys come up with!! So this is only the beginning in glitter combinations LOL! As you all can tell, I am just head over heels in love with this manicure and I did not want to take it off, I wasn`t expecting much in terms of tip wear or chipping but I was surprised that it lasted around 3-4 days before showing any signs of wear. However, as with many or ALL glitters, it was not the easiest to get off but DEFINITELY worth it!!! I shall be scoring this review as a combination. Do you own Milani Purple Gleam or Sally Hansen Extreme Wear Rockstar pink? GORGEOUS!!!! I too am hooked on glitter right now. I can’t get enough of it!